All copies are in use - 8 copies are available for full accounts. 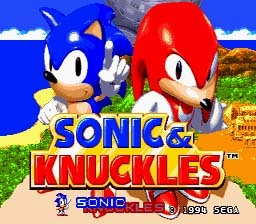 Play Sonic & Knuckles Now! Sonic and Knuckles plays a lot like the other Sonic Games. You only use one of the buttons. The one button does different actions at different times. The coolest thing about it was the ability to plug Sonic 2 or 3 into it and play them as Knuckles, which was a first in America. The graphics have a lot of bright colors and are well drawn without looking too pixelated. The story was kinda uninteresting. Again, you have to stop Dr. Robotnik from getting the chaos emeralds. This game is a lot of fun. If you like Sonic games, you'll love this.